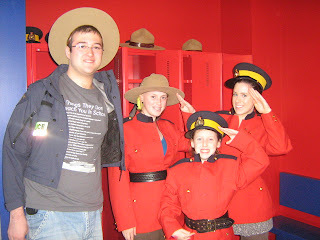 This is my son (Craig) and my nieces Heather, Laurel and Holly at the RCMP Heritage Centre here in Regina. Kelly and the girls were here in July. They had lots of fun touring around Regina, believe it or not.... went to all kinds of places that a person who lives here never does! Thanks for the update. Great picture of the kids. I bet they had a great time. Glad to hear that you are doing OK. I do hope that you will be up for your Chapters outing. I imagine that the variety would be appreciated. Glad you are breathing easier and hope you get that latte! We are just back from a quick trip to Billings. Glad to hear that you are feeling better. Hopefully that trip to Chapters will come soon. In the meantime, take care. Thinking of you and sending warm thoughts and wishes your way. We did have a great time in Regina - there is alot to see! We also enjoyed the MJ Tunnels, Science Centre, the musical "Oliver", Corner Gas Set, a Harry Potter party, walks around Wascana Lake, and a trip to Lebret. Yes Gwen, everyone gets to try on the RCMP uniforms! Thanks to Dad and Mom for all of the chauffering! Thinking of you Jo and hoping you get that trip to Chapters! I sure do look forward to the next updates from you. It's good that you seem to have no trouble finding things to share with us all, it reminds me of my mom and her efforts to keep up with everyone by letter writing. It seems to be a practice gone by the wayside now, but she still writes little notes to family and lets us all know what's new. Your blog gives us a modern way to carry on that communication tradition. So good for you and great for us, I have to tell you though, that you get far more replys than my mom ever did! I also find it interesting to read the replys of everyone else, I feel like I'm getting to know them too! I send you all the best in this week ahead, may you feel blessed! A little birdie (Kelly) told me you got that trip to Chapters in today. Excellent!! Hope you had a great time and relaxed with a latte too! Squirrels are just starting to show up in our neighbourhood, I guess the trees are finally getting big enough, but I too battle the "wascally wabbits" who seem to take great joy in keeping my annuals in a state of perpetual greenery. Blossoms must just be too tempting! HI JOANNE, WE JUST WATCHED THE GREEN RIDERS MOVE INTO FIRST PLACE YEAH!!! CAN'T WAIT TO TALK TO OUR ESKIMO DIE-HARD FRIENDS. THE HANSONS ARE HERE FOR A FEW DAYS SO WE DID THE WEST ED MALL THING TODAY. IT HAS BEEN POURING RAIN ALL DAY,SO YOU CAN GUESS WHAT THE MALL WAS LIKE. WE MET COLLEEN AND CHRISTINE FOR LUNCH.SHE STARTS A JOB IN RED DEER AT A CAR DEALERSHIP AND STARTS TRAINING ON SEPT 3. GOD KNOWS WE NEED GALS LIKE HER! GLAD TO HEAR YOU MADE IT OUT TO STARBUCKS TODAY. YOU'LL BE ENJOYING THE BOYS AROUND THIS SUMMER. GLAD YOU HAD A NICE VISIT WITH THE SHERLOCKS. THANKS FOR THE EFFORT OF KEEPING US POSTED. I'M SURE THERE ARE DAYS YOU DON'T FEEL LIKE IT BUT WE SURE APPRECIATE IT. I've just logged in on my laptop to find that you HAVE updated your blog! My main computer didn't refresh your page (even when I had logged out! Strange) and I assumed you simply hadn't posted. Glad that the transfusion has helped you feel stronger. But the main reason I'm commenting to this post is...... is that where you took us when I was in Regina?? PS. It's Ferg's birthday today, and I wore the RCMP apron while cooking his chocolate mud cake!